Pallets are placed by forklift on nested carts riding on inclined rails. Each pallet is then pushed back by subsequent pallet loading, exposing the next cart. When removing product, the forklift takes out the front pallet, allowing the pallets on carts behind it to roll gently to the front of the rack. The nested carts make placement and retrieval easy. Instead of single pallet-deep selective racks, a Pushback rack system lets you store pallets 2 to 5 deep while retaining easy access to a variety of different SKUs. 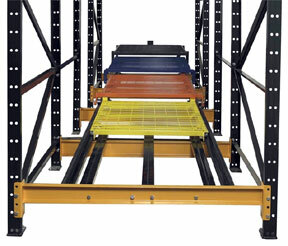 The SK3600 Pushback rack system also offers the unique advantage of a single source solution. Steel King manufactures both the cart system and the racking, so there is never a chance of one vendor playing against the other. You get everything from one source who takes full responsibility. The system is also easy to install: simple, drop-in cart rail assembly shortens installation time and reduces the chances of errors or delays. 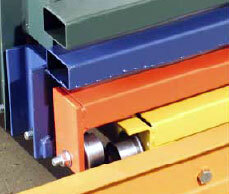 Rigid rail design is constructed from 55,000 PSI high-strength steel. 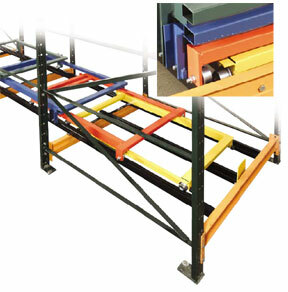 The fully welded frames offer greater rigidity than lesser rack systems. This rack is maintenance free and offers a very long service life, along with safer operations and better product protection. Why a pushback rack system? Fixture welded to +/- 1/32"
The pushback wheel is an 8620 chrome-plated, through-hardened steel wheel with a ductile core. It offers excellent shock absorption, a longer wheel life, and low to no maintenance. Precision, self-contained ABEC quality bearing is dust and debris resistant and has a 2,000 pound capacity per. Bearings are easily replaced if necessary. 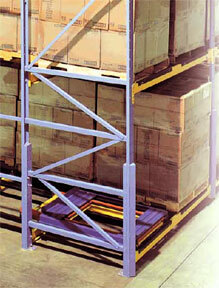 Pushback racking systems allow more selectivity than drive in racks, but less than selective systems. They provide more storage density than selective systems, but less storage density than drive in racks. If you need assistance specifying the right rack for your application, contact us today. For nonstandard pallets, weak pallet support, or other problematic storage issues, Cisco-Eagle can help you create a pushback system that will accommodate your load and your operation. Submit a pushback inquiry or call us toll free for more assistance. Which type of rack are you looking for? 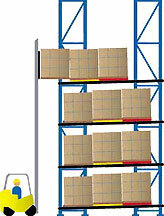 Pallet Flow Rack - Pallets are loaded at the back of the rack, sitting on sloped rails so that they roll to the front of the rack for unloading. Pushback Rack - Pallets are loaded and unloaded from the front of the rack. The pallets sit on sloped, nested carts. Each new pallet loaded pushes the previously loaded pallet towards the back of the rack. When a pallet is unloaded, the pallet behind it rolls to the front. What kind of pallets are you using?